Near my apartment I found this amazing example of what the French call “trompe l’oeil” which translates to “fool the eye.” I’m sure you’ve seen examples of this before, as I have, but never one of this magnitude. The photograph at the top of this post shows the extensive painting on these buildings. 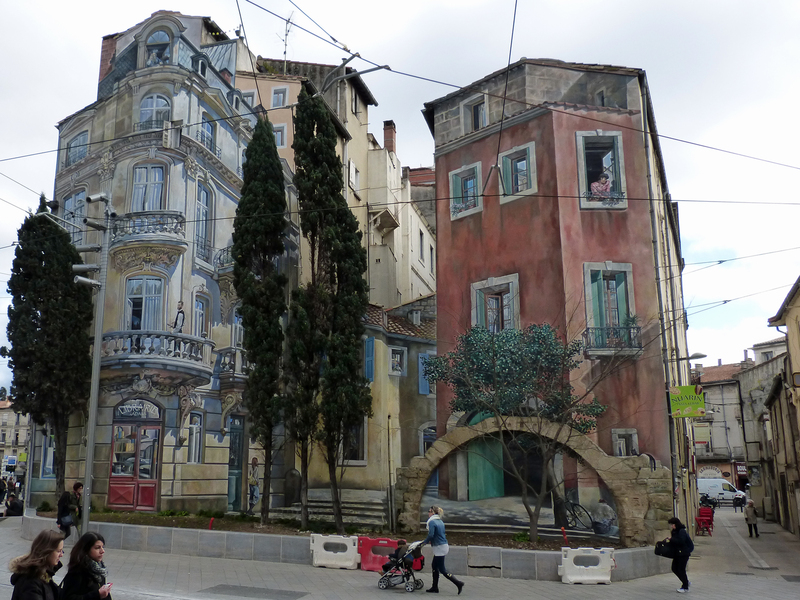 Nothing you see on these buildings is real – it’s all been painted there. The first surprise occurred yesterday when I was walking to the apartment with the lady who manages it. We saw the city’s fleet of trams. There are four lines and three of them has a different design painted on the cars. Very clever. I was walking along a main avenue, quite busy, it was lunch time, when a beautiful old stone wall at the end of a side street caught my eye. When I wandered in to see what might be there I discovered the ancient narrow streets where the very rich citizens of the 17th century built their homes. Today these streets are lined with small shops, but it’s still possible to discover the huge stone mansions from the past. Wandering around lost, near my apartment but unable to find the street, I looked up and discovered this huge edifice beside me. Turns out it’s one of two surviving gates to the city from the 13th century. It was very common for European cities to be walled to protect citizens from attackers in the middle ages. The surprise for me was that nothing I have read about this city mentions these gates or the surviving walls. The next surprise isn’t really a good one. 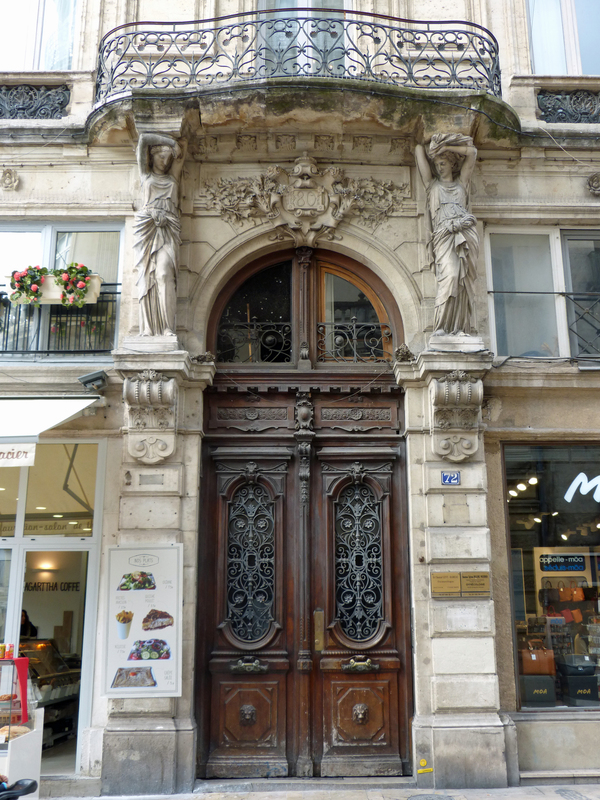 This city is filled with extravagant French architecture from (mostly) the 18th and 19th centuries (like this doorway above). I’m noticing especially how beautiful the iron work on the balconies is. The surprise is that there appears to be no maintenance on these buildings throughout most of the city. In the main tourist location buildings are clean but most of the city is crying out for power washing! That’s a sad surprise. Finally, this little guy was a surprise! Outside the main shopping mall (a huge one!) 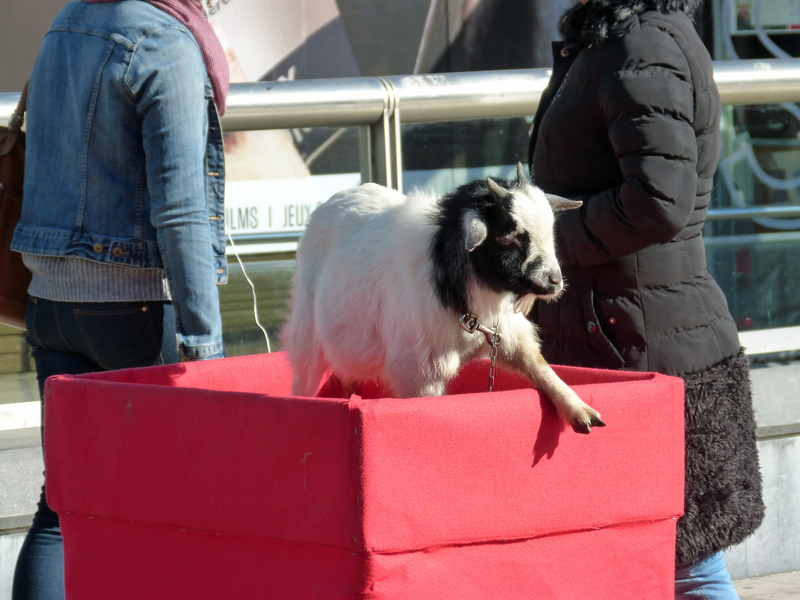 a man and a young woman had this young goat in a red box. The man said something to me as I passed but I have no idea what it was. Do you think they were trying to sell this baby? 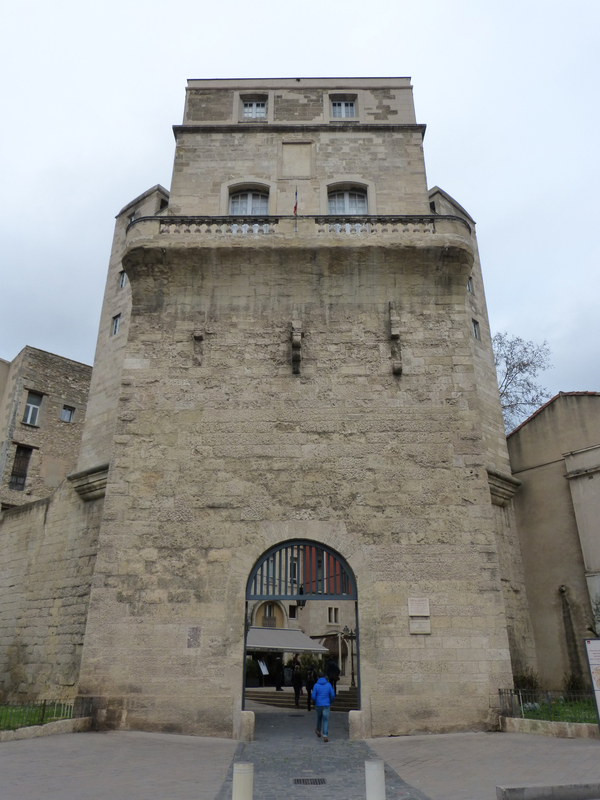 This entry was posted in France by Libbie Griffin. Bookmark the permalink. Your photography and the discoveries you are making are just fantastic! Thanks Patti! I’m having a great time. look forward to your blog every day. the painted facade is wonderful. Wally, I’m glad you’re enjoying my blog. I’m having fun writing it and deciding which pictures to use. The next few weeks are going to be very colorful! The Mediterranean you show is breathtaking beautiful. I am really afraid that the little goat (kid) is due to end up in a cook pot or grill. Oh, Elinor, I hadn’t even thought about that possibility for the poor little goat. I’m afraid you may be right! What a delightful day and I love the photos of the surprises! 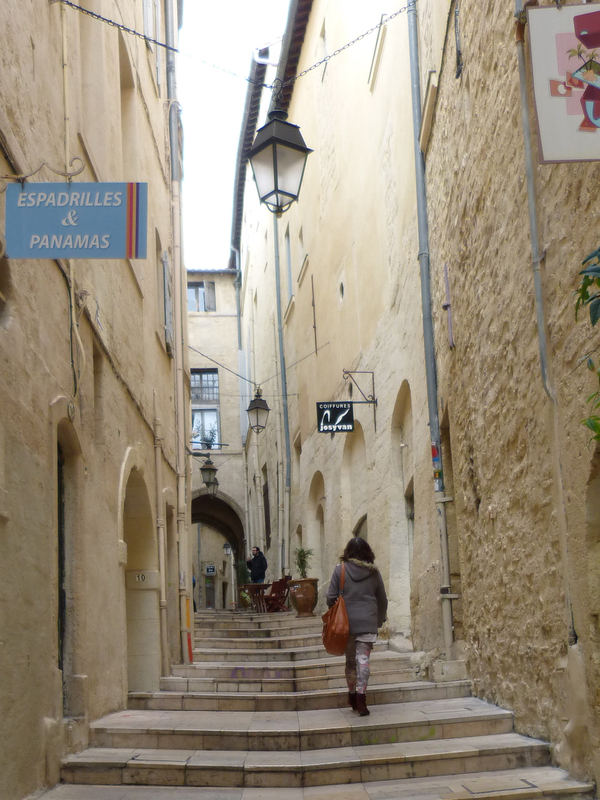 I’ve never been to Montpellier, but it will definitely be on my list if I go to that region of France! 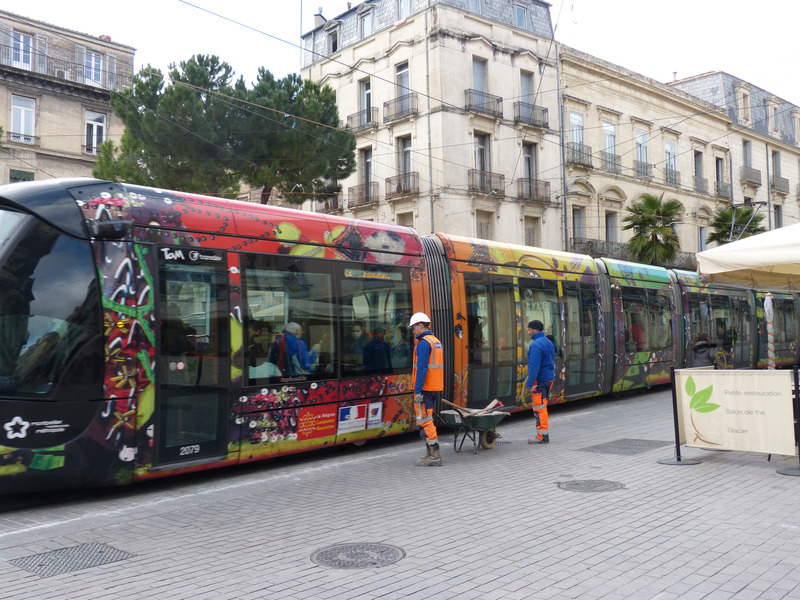 Montpellier is quite different from any other French city I’ve seen. Clearly it was very rich a couple hundred years ago. The part I “lived” in for three days was obviously not the rich section of town. The center has been well maintained and has at least one high-rise modern building with a major shopping mall attached to it. It rained the second day I was there, and after soaking my feet for an hour I hid out for most of the rest of the day. I missed seeing a number of places I’d planned to visit.